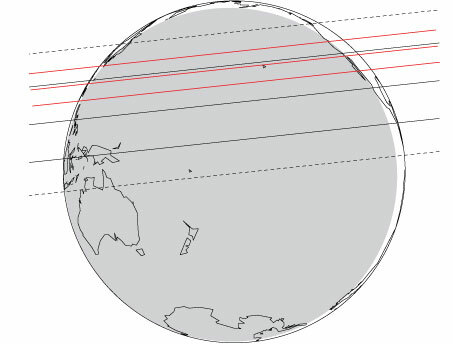 Across the globe pictured above, the six solid lines correspond to the northern limit, centerline, and southern limit of Pluto's (Black) and Charon's (Red) shadow. The northern and southern limits of Pluto correspond to a radius of 1400 km (605km for Charon). The upper and lower dashed lines indicate 3-sigma errors. The shaded area represents where the sun is more than 12 degrees below the horizon. From 75 USNO 61-inchTelescope frames. See note 4. 3Measured position corresponds to RA offset of -0.2387'' and Dec. offset of +0.056''. 6Data from the Lowell 42-inch, SMARTS, du Pont, USNO 61-inch, and Lowell Astrograph telescopes over the span of 6 years were reduced with respect to stars in the UCAC2 catalog. A model was developed to fit the residuals obtained from our measured positions compared to that of the object's JPL ephemeris. All residuals obtained from the different telescopes were consistent with the model. The model includes the first-order effects of errors in the orbital elements of Pluto: (i) constant offsets in RA and Dec, (ii) linear (in time) offsets in RA and Dec, (iii) sinusoidal terms with the Earth's orbital period, and (iv) sinusoidal terms with the Pluto-Charon mutual orbit. The model was propagated to obtain the predicted position and error of the Pluto at the time of the occultation. The errors listed for the Pluto are the RMS of the models fitted. 7"Distance" refers to the closest approach distance of the "Site" to the center of Pluto's shadow in the shadow plane. The errors on all closest approach distances are ±408 km (one standard deviation). "S." means the site is south of the center of Pluto's shadow. "N." means the site is north of the center of Pluto's shadow. 9The errors on all times are ±0:20 (20 seconds; one standard deviation). The solar altitude is given for locations where it is relevant (solar altitude greater than -18°). No entry in the immersion and emersion columns indicates that the occultation is not predicted to be visible at that site.